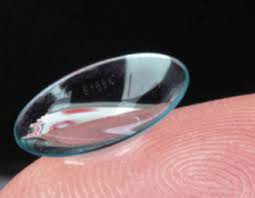 My 13 Cents: Cheapest Place to get Contact Lenses? 12 boxes of Acuvue Oasys (total price including shipping). Lens.com: $59.95/box of 12- FREE SHIPPING and no promo codes needed cause they just have the lowest prices without having the hassle of promo codes and coupons. Note: It's better to buy in bulk (1-2 year supply) to save more money. It is always smarter to buy at least 12 boxes because you will get a better per/box price. You might find a cheaper per/box price on the contact lenses, but AFTER you include additional fees and shipping, Lens.com is almost always cheaper. If you buy a year supply, you can get a steep discount. As a side note, if you purchase Acuvue contacts you can get a $25-$70 rebate on top of the above prices by filling out a form HERE. This is only valid for in-store purchases. If you buy your contacts in a store then, Costco or BJ's are probably the best in-store options. You know of any cheaper way to get contacts? Thanks for the tip, just saved me a lot of money! Just went to Acuvue's site and copied this. Rewards are not available for internet purchases and purchases made at: Costco® Optical, Sam's Club® Optical, BJ's® Optical, Walmart® Optical and Target® Optical. Other offers may be available for ACUVUE® Brand purchases at these retailers. Nice post. Keep sharing such informative post. Lens.com is the best deal you can get. I get Biofinity which are very expensive to buy, and at Lens.com I save a ton of money. Last year I bought a year supply that cost me around $78. I will be buying from them again. We are being ripped off my the contact lens solution manufacturers as well. Thank you for this post! I nearly just spent $100 at Sam's club for a six month supply but with your guidance, I was just able to score a full year supply for just $11 more after discounts, rebates, and cash back! Thanks so much!!!! Thanks Ashley for sharing, contacts can be expensive so I wanted to share how to get the most bang for your buck! Shopping online and buying in bulk are two effective ways to save money. I noticed contact lenses are much less expensive when you purchase them in bulk. I bought eye drops from this coupon. I think for a year's supply, it's around $100. I've also gotten a $30 rebate from AcuVUE the past two years I've ordered, so it comes out to around $70. Doesn't matter much since my vision insurance covers up to $125 worth of contacts per year, but it's pretty good if you don't have insurance. Hey I just got a box of accuvue oasysis hydroclear plus and my vision started to get blurry about an hour after I put them in. They gave me a slight headache and I was a tad irritable throughout the day just because my vision kept changing from decent to blurry. I put my old ones back in (Regular oasysis hydroclears) and there was no problem whatsoever. Anyone else have problems with the newer version? I believe they came out with the "Plus" style within the last two years. Do not buy anything from visiondirect.com. They no longer stand behind the products they sell. If you order gets lost, if you receive a defective item, etc., starting April 19th, that is 100% on you. I found a good delivery service https://www.6connect.biz/ . I order there delivery contact lenses. Tracking is available on some Standard Delivery services and on all Express Delivery services. You’ll receive a shipping confirmation email from the warehouse with a tracking link for your parcel so you can follow its journey. Just compared Lens.com against 1800-Contacts, Walgreens, and Wal-mart for Air Optics Night & Day Aqua and Walgreens had the same price, but with the mail-in rebate I saved $60 with Lens.com. Cha-ching! Thank You! Record of loan repayment has turned into a factor in deciding a man's advance endorsement. Business has not been benevolent to them either.